The sensational duo of Amitabh Bachchan and Rishi Kapoor are back on the silver screen for the first time in 27 years, for their first collaboration since working together in ‘Ajooba’ almost three decades ago, this time as father and son to give a whole new meaning to love and family in this age-less comedy titled 102 Not Out. “102 Not Out celebrates life and the unbreakable bond between a parent and a child. The fact that it brings legends Amitabh Bachchan and Rishi Kapoor as father and son for the first time makes it doubly special! We hope this family entertainer touches your hearts the same way it has touched ours!” says Vivek Krishnani, MD, Sony Pictures Entertainment, India. The bond between a parent and child is unique, but there is nothing quite like that of a larger-than-life 102 year old father and his cranky 75 year old son. The father, 102 years “young” Dattatraya Vakharia (Amitabh Bachchan), lives a life full of fun and harbours the dream of breaking the record for the world’s oldest living man, but thinks his grumpy 75 years “old” son Babulal (Rishi Kapoor) is a going to slow him down with his drudgery old ways. Billed as the most unusual father and son love story, the movie is based on playwright Saumya Joshi’s well known Gujarati play by the same name and has been adapted into a feature by him. 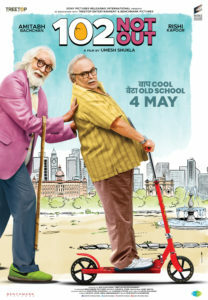 Official synopsis: 102 Not Out – is an ageless comedy that brings together Indian Cinema’s two biggest stalwarts – Amitabh Bachchan and Rishi Kapoor after 27 years, with the two legends playing father-son duo for the first time. Will Dattatraya Vakharia break the record of world’s oldest living man? To find out visit your nearest theatre on 4th May 2018. A Sony Pictures Releasing International Presentation and worldwide distribution, the Umesh Shukla directed 102 Not Out is Produced by SPE Films India, Treetop Entertainment and Umesh Shukla’s Benchmark Pictures. We certaily cannot wait to see the magic of these two actors come alive on screen!